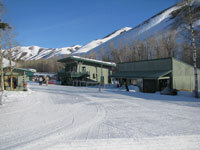 Soldier Mountain made headlines in 1996 when Actor Bruce Willis bought the 1948 ski area, and again in October 2012 when he donated the Idaho ski area to a local nonprofit. November 2015 a couple from Oregon bought the ski resort for just $149,000. Soldier Mountain is located in central Idaho on the way to Sun Valley from Boise, in the serene and scenic town of Fairfield. Despite the Hollywood mogul’s ownership and two more change of hands, Soldier remains a humble ski resort with 1,150 un-crowded, under-appreciated acres. Three dozen runs from the 7,177′ Soldier Peak range from surprisingly well groomed cruisers to spacious bowls and glades. In fact, Willis gave Soldier Mountain away for a $1 to the worthy non-profit, since he doesn’t get to Idaho much these days. He was also selling his Flying Heart Ranch and The Mint Bar near Sun Valley for half price, 50% of $15 million he invested with former wife Demi Moore. Two long fixed grip double chairs serve up a variety of terrain, from undulating well groomed trails Stagecoach and Pony Express to black diamond Braveheart and Snow King. Lift attendants here wear Carhartts and tell jokes as they load the two consecutive chairs (1,425′ total vertical). The panorama of the surrounding Idaho Rockies is worth the price of admission.Soldier Mountain is great for families, with affordable ticket prices ($35/adults and $19 for kids) kids six and under ski free. Soldier is open Thursday through Sunday. A new base lodge serves homemade fare with a smile on the side. The upstairs pub offers a perfect view of Soldier’s slopes. There is a master plan for four new lifts and added terrain, but small skier visits don’t support Soldier’s expansion, even with the new management – five local businessmen. So, you can hit some of the backcountry bowls with a traverse. If you want to reach 10,095′ Smoky Dome’s awesome acreage, then Soldier’s Snow Cat skiing at $275 a day promises private powder. You can take your kids cat skiing, if they are experts. You will get about 15,000′ vertical of backcountry bliss with a guide, and lunch at a mountaintop yurt. Word is Willis originally bought the Idaho ski area for the cat skiing. 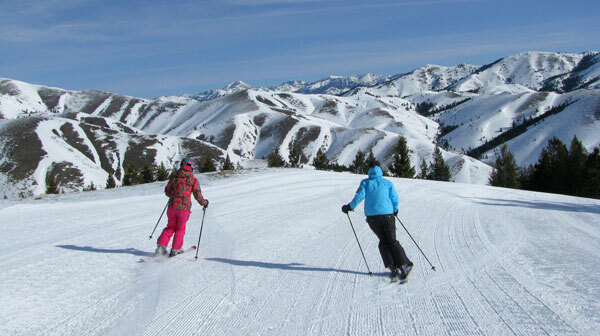 If you are traveling to Sun Valley, you owe it to yourself to stop at Soldier Mountain Ski Area. 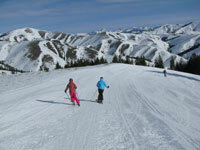 The skiing and riding here is in complete contradiction to nearby glitzy glamorous Sun Valley. Soldier is homespun, unhurried, unpretentious. There is no Hollywood crowd here, trust me… you are highly unlikely to bump into Demi Moore, Ashton Kutcher or Diehard skier Bruce Willis. Better chance of catching skiing celebs at Sun Valley just up the road in Ketchum.